Ice is the perfect Rorschach test. 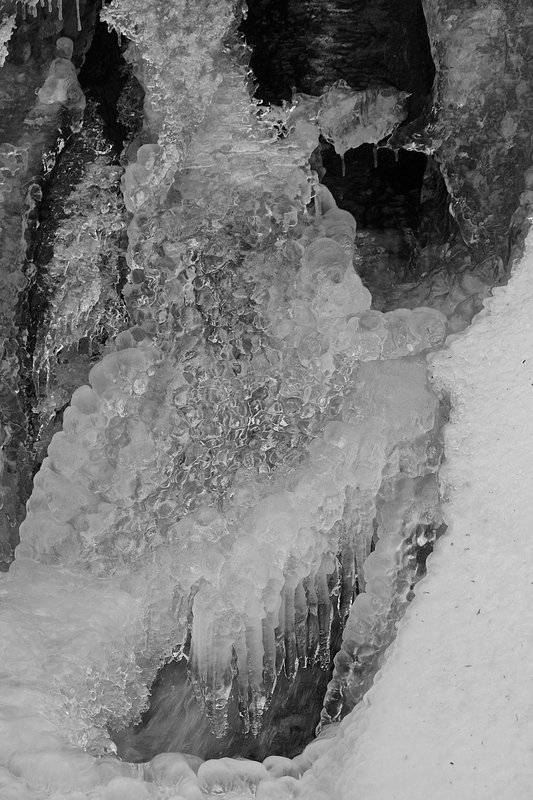 When I look at these photos of the waterfall ice, I see all sorts of things among the patterns of light and dark, clear and opaque. Do you see the Buddha in the cave? 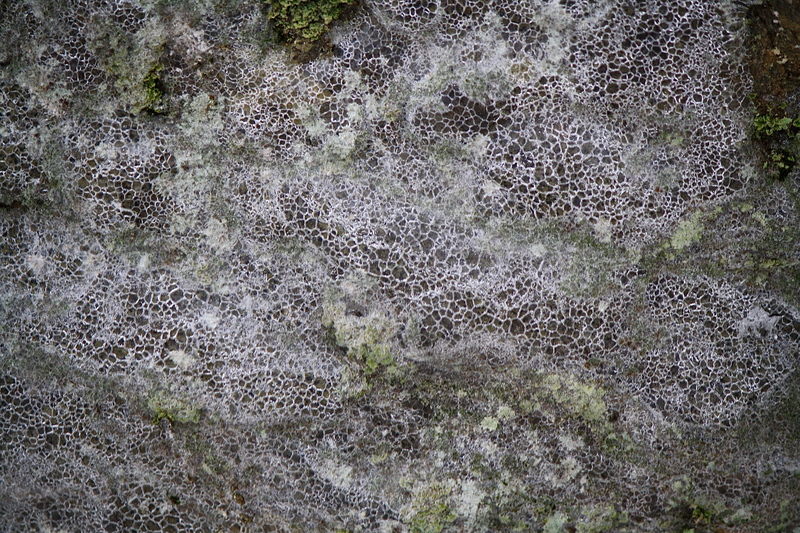 Or how about this crackle glazing on a moss and lichen covered boulder? Looks like reptile skin to me. Speaking of reptilian, I see a dinosaur skull with eye socket and sharp teeth. How about you? You can see the water flowing behind the creature’s mouth. It may be simple entertainment, but it gets me out in the fresh air to enjoy the Ice Fantastic! 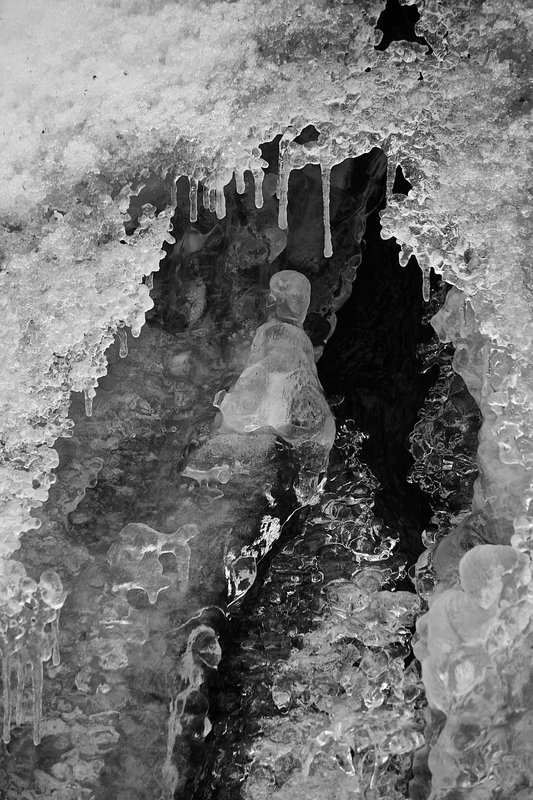 This entry was posted in Field Notes, My Photos and tagged fantastic, frozen, Ice, icicles, imagination, nature photography, observation, photography, Rorschach test, visual fantasy, waterfall ice, winter. Bookmark the permalink. I can see him… fabulous pics! I owe a lot of my contentment to a good down coat and lined boots! Thanks, G. You must have great examples of ice around the lake. But very chilly viewing! The second picture looks like a little boy riding a toy car into a cave. The last picture looks like someone holding his nose and falling backwards! I used to love doing this with clouds when I was a kid. Very nice pictures! Thanks, it’s fun trying to see what others are seeing. My sister and I used to cloud gaze (I still do!). I especially like the second one. I see a bird in profile, looking back for just a moment before venturing into the ice cave. Yes, another said similar, I can see it. Isn’t ice just amazing? I hope you are well, haven’t seen much of you on the blogosphere lately. Or is that just my imagination? Yes, ice is a whole different world. It can be kind of magical, can’t it? You’re right, I haven’t been wandering around the blogosphere much lately. I’ve had a few excursions, but I never got around to posting any of the pictures. I should do that. And, I signed up for Otto van Munchow’s online photography workshop. Our first assignment is due tomorrow. How exciting! I visited his site. Is this for street photography? Will you be posting your assignments? Looking forward to seeing how you like it. Glad you are doing well in sunny LA! I totally see Buddha now that you pointed him out. I have the most unimaginative of minds, Eliza, but can easily be led along. I’ve been looking forward to some snowy-icy shots from Massachusetts. Glad you are not bored with my continued ice shots. There are plenty to choose from up here! Windchill today Neg. teens – yikes! 😀 LOL! What is ‘normal’ anyway? Otto von Munchow’s workshop isn’t about street photography. It’s called “Finding Your Photographic Voice”. As best I understand, it’s about exercises in sensitivity to the elements of a photograph, with the goal of being able to express what it is you want to express. The workshop is my Christmas gift. I won’t be posting any of the assignments that I turn in. But — I took pictures on my excursions that don’t really qualify for the assignments, but which I like. So I will post some of those. Ice Fantastic is right, these images are amazing Eliza! I liked this Eliza. It really shows us what we look for in life. Thanks, Robin. GMTA, eh? 🙂 Glad I got these shots when I did, as they are now buried under snow. As someone else has commented above, Eliza, your ice photographs are stunning. I could never grow tired of them. Aw, thanks, Rebecca, that is so kind of you to say! Love all the textures and patterns of the ice… when it comes to winter I just have to live vicariously through your photos! Much easier that way! 😉 Thanks for stopping by and commenting! 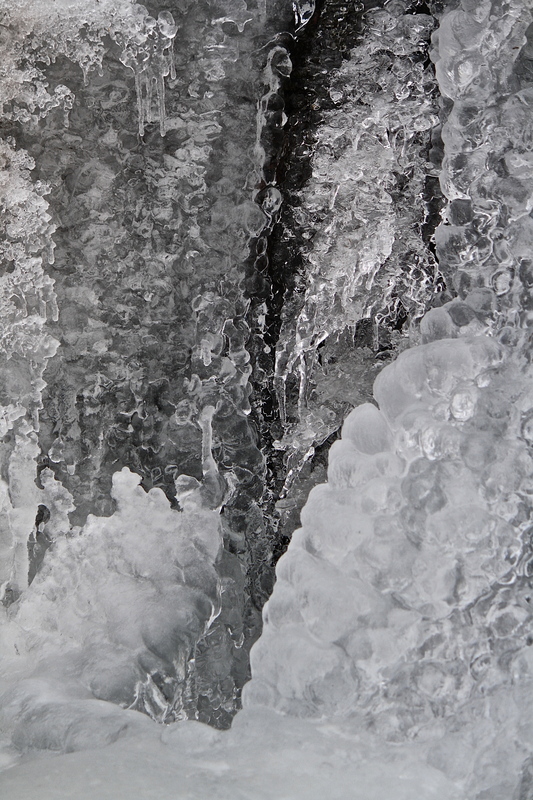 These ice formations make for great abstracts! Well done! Fantastic Photos! Photo #1: On the far upper left, I see a person bent over and writing on something…the far right, a woman looking at the man writing, and a short distance at the top on the right, a person looking at the woman. Photo #2: In the center, I see a fairy, with her wings down, looking towards the inside of the ice. Photo #3: Snake skin. Photo #4: In the upper far left, the little fairy again, with wings down, more content than the view in photo #1. These are my responses. Fun! Love them all! Thank you, Eliza! Thank you for sharing your impressions, Jane, it is all such fun! I see a bird in the cave, but no Buddha. Love the reptile skin! I do that too. I see shapes and faces in everything – ice, rocks, clouds. I love letting the imagination wander. Brings out the inner kid. Beautiful pictures, Eliza. Just gorgeous. Thank you, Mary. It is fun (and healthy) to let our imaginations wander!